1. 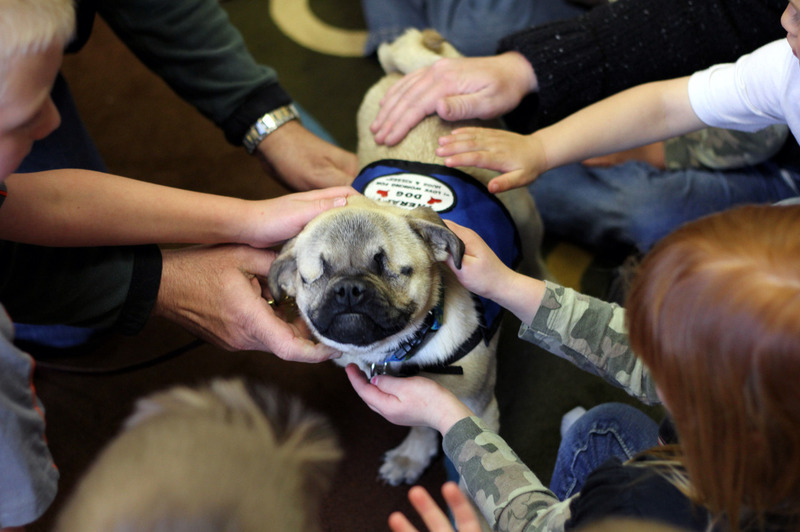 Please read this story about this blind pug! He is the sweetest. It's a quick little read and you'll gain such joy! 2. I doubt I'd call this a quick little read but I'm sure it would bring joy regardless! It seems as though it's going to be featured in a little Yoga Dork giveaway. Here's a hopin'! 3. And here's a hopin' that whenever I try out this recipe for baba ganoush, it will be a winner. A friend of mine served it, or something similar at her wedding last weekend and I just can't stop thinking about it. Sounds perfect for vegan day! I wandered over to Giardina's after yoga this week, one of the fine young chefs whipped it up for me. So yum! Olive oil, angel hair, red and yellow peppers, mushrooms, garlic, herbs. Score one for vegan day! 5. Did you know this? This image was taken from the blog Life + Dog, specifically from an entry called If We Could All Just Try Harder. Look for a woohoo! Wednesday entry on this shiz real soon. 6. Changing gears on you for a minute, we got a new vacuum cleaner! The only reason I'm telling you about it is because I'm weirdly obsessed with it. Here...go check it out here. I wanted to take a picture of the amount of hound fur (possibly ours, possibly a hound that lived in the house 8 years ago, I just don't know) that was extracted from the carpet but I didn't. I was going to, said WAIT...let me get my camera as Brandon was going over the carpet for the second time. Brandon said NO. Do not document this. And I pouted. And now I'm telling you about it. Isn't that gross? Eeeeeeee. So gross. 7. Changing gears yet again, have you ever noticed how challenging it is to find good news out there? I have. I often do an activity in group where I challenge the group members to share about one positive thing they've seen / read / heard on the news lately. Most of the time, this question is met with lowered eyes and uncomfortable shifting in chairs. You know why?? BECAUSE FINDING GOOD NEWS ON THE NEWS IS DAMN NEAR IMPOSSIBLE! Believe me. I look. It's tough out there, kids, real tough. Lots of bad stuff. Lots of people being led by bad mind and doing things that just aren't cool. With this being said...my heart was much lighter yesterday after learning that Abby the Pitbull had been found and was awaiting a sweet reunion with her family. Did anyone else follow this story on the Facebook? I was obsessed. Obsessed. Like maybe it was a little unhealthy. The obvious goodness in this was that the little hound (can a pit bull be a hound? Sure. An akita sure isn't a hound but except in my world) was found safe and relatively healthy. The goodness past that was that so many people stepped up to help out! Go humanity! Go Mississippi! Ahhhhhh. Score 1, hell score 5, for goodness. And seriously...heard any good news lately? Please share it in the comments. 8. I got a Decadron + Rocephin shot yesterday. I thought it was allergies, the NP at our rural clinic thought differently. Hello super germ. Whatevs. ANYWAY. I've already decided that I'm going to use this as an excuse to have a de-lux chicken on a stick from the gas station in Ruleville because you know that shot makes you hungry like a feral creature. Jealous? You should be. It's got onions. And bell peppers. And potatoes. And the chicken isn't creepy. Hope you've enjoyed reading the hot mess that is DTA today! Be well this weekend. Love each other, do good work. Kick your feet up, eat something you love. Take care of those you love including yourself! Move that body. Sending light and love to all you turkeys!! Be One Of the Helpers!